This walk: 2013-5-15. Hurston Water, River Bovey, Bushdown Mine, leat, gerts. Assycombe Hill. Fernworthy Forest, Hurston Ridge double stone row, cairn, cist, Kes Tor, hut circles, Hurston Castle, West Vitifer Mine, buddles, wheel-pit, waterfall, Bennet's Cross. Link to Google Satellite view of the area - the car park is north-east of the Warren House Inn (marked at the bottom of the map) where a track leaves the B3212 road in a south-easterly direction. 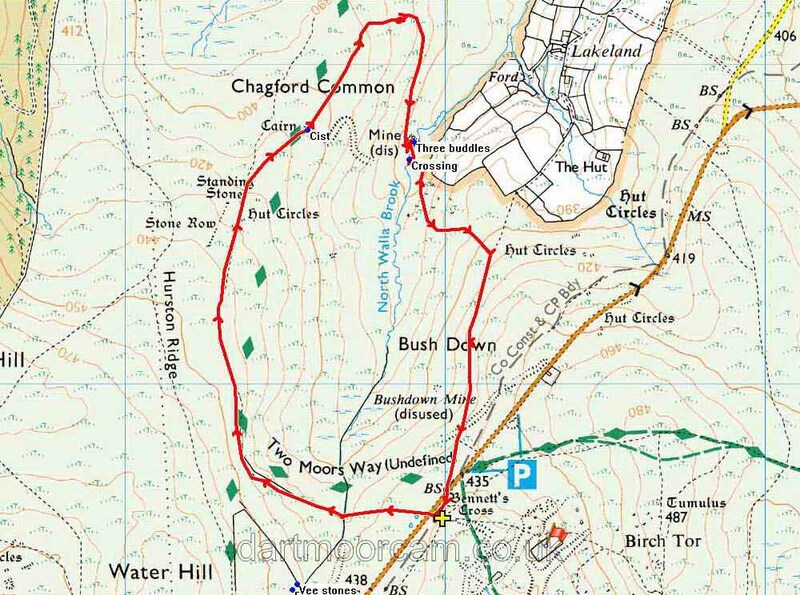 The walk route is shown on the map at the bottom of this page. Head mire of the North Walla Brook (as marked erroneously on the map, according to Hemery, p. 710, citing Crossing as well over the name) or Hurston Water, a local name still in use according to Hemery, which is really the head of the River Bovey. In this area are the disused workings of the Water Hill Mine more towards King's Oven (SX675812, Helen Harris, 1968,The Industrial Archaeology of Dartmoor, David & Charles, p.47) and the Bushdown Mine (SX680818). Hemery uses the name of Boveycombe, for this spot? The Jeremy Butler map for this area (Vol. 2, Map 25) shows this as "River Bovey". A former high-capacity leat, crossed in the area of SX 6736 8180, that once carried water to the tinning gerts of the local mines, including that of West Vitifer Mine (pronounced "Vite-iffer" by old miners interviewed from the main Birth Tor/Vitifer mine that closed in 1913. Zoomed view to Assycombe Hill and Fernworthy Forest. Xoomed view to Hurston Ridge double stone row, visited on 20 June 2012. West Vitifer cairn, SX 67570 82794, excavated by the Barrow Committee of the Devonshire Association in 1897. They discovered an undisturbed cist with a perfectly preserved beaker that immediately fell to pieces. It was restored and is now in Plymouth Museum. Urns of a similar nature from Dartmoor can be seen HERE. Zoomed view to Kes Tor or Kestor Rock, SX 6654 8628, 2.85 km (1.8 miles) distant. Group of three hut circles, known as Hurston Pound: this is described by J. Butler (1991), Dartmoor Atlas of Antiquities II, The North. 25.9 Hurston Ridge stone rows and settlement, pages 30-31. A solitary thorn tree seen along the way. A view of three buddles. Click the image to see a larger version. Three buddles' location is 50�37'46.2"N, 3�52'08.6"W or SX 67905 82758. Google Maps Satellite link to the three buddles - you can see the straight wall beside the buddles in the centre of this aerial view, running top right/bottom left. Two buddles are below the wall, again top left/bottom right and the third buddle is just south-east of the bottom left one of the pair mentioned. A protective wall beside the buddles - what was it's function? Syanding on a "clapper" type roof to a tunnnel from a buddle, just to the left can be seen another tunnel exit. "This is where we were going to cross the Bovey" ...... we actually crossed a little way upstream, at SX 67890 82703, where the banks were about 1-foot apart. I was trying t5o pgotograph some nice new fresh gorse flowers but the wind was too strong for close-ups, so here is the whole bush! An old wall or remains of a reave? A cut stone beside the road across from Bennett's Cross: apparently not inscribed - the reverse face was very rough. A final look at the cross, across a small clapper bridge on the track from the car park. This walk was reached by parking at the Bennett's Cross car park on the B3212, just past the Warren House Inn when travelling from Postbridge, marked by the yellow cross on the map. Distance - 4.47 km / 2.8 miles.